He has been sold and is moving to Texas. Contact his new owner Renegait Ranch by email here. Visit the Renegait Ranch website here. Photos by Free Rein Designs. Pure Luck is blue papered, and blood-typed homozygous tobiano. He is triple registered Missouri Foxtrotter and Spotted Saddle Horse & Pleasure Saddle Horse. You can breed a mare from ANY gaited breed to Pure Luck and the foal will be eligible for registry in the PSHR. Lucky has a very sweet, kind disposition, and a great natural foxtrot. His foals all have his incredible disposition and natural foxtrot. All of them are tobiano, most have been black & whites. 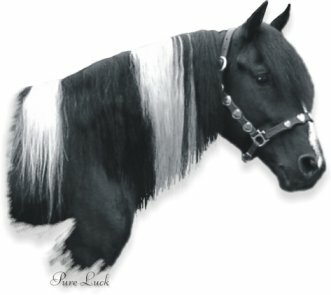 Lucky has had 100% tobiano foals.